Pentecost was first sighted by Bougainville on May 22, 1768, the day of Pentecost. 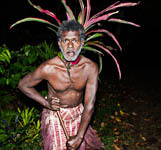 It was also sighted by Captain Cook during his 1774 voyage through Vanuatu. 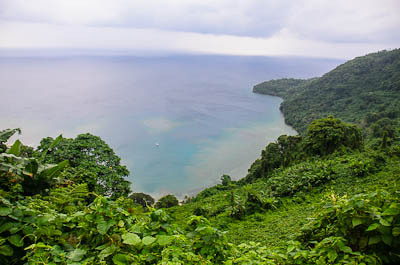 Pentecost is a lush and mountainous island 60 kilometers (37 miles) long with a population of about 12,000. There are no major towns but a number of villages along the west coast and a few inland. The east coast is wild and inaccessible, with relatively few inhabitants. The only villages are in the southern part. While Pentecost was influenced by Christian missionaries it remains relatively untouched by Western influences and local traditions remain strong. 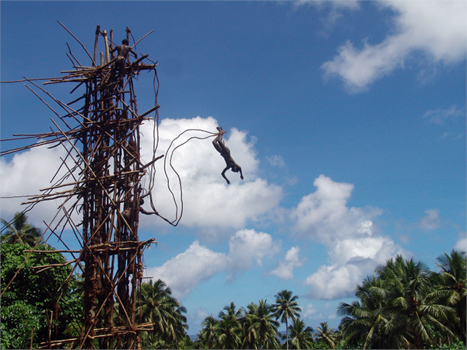 The island is the home of the nanggol (land diving) – the first bungee jump. 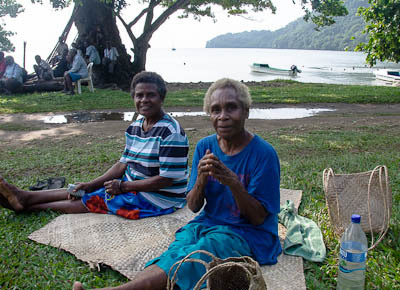 The ceremony, taking place between April and June, celebrates the first yam crop emerging. From tall towers (around 20 to 30 meters - 60 to 100 feet) constructed of saplings and branches held together with forest vines, the men leap forward and down to touch the earth below in a ritual believed to ensure a good yam harvest. Nowadays, tourists pay large sums of money to witness the ceremony. Pentecost Island is for the adventurous traveler. 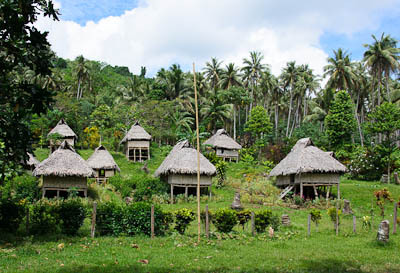 Don't come if you expect 5-star luxury: infrastructure and tourist facilities are basic, roads are muddy or non-existent, food is simple and traditional, and nightlife is limited to the village meeting huts in which men pound kava roots to drink as the sun goes down. However, if you are prepared to rough it a little, you will be rewarded with a real island feeling which comes from genuine cultural experiences with friendly and welcoming local people, in one of the most beautiful places on Earth. If you are visiting by yacht Loltong is one of the nicest protected anchorages in Vanuatu. 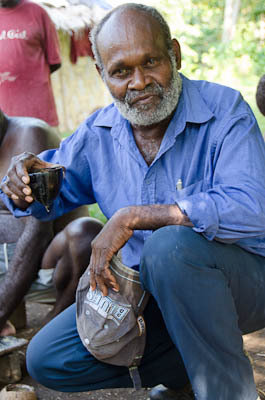 The north Pentecost village of Laone was the home of Walter Lini, who led Vanuatu to independence in 1980. 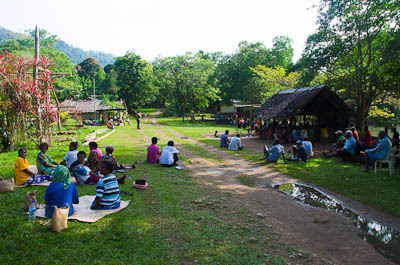 Near Wali, in the southeast, is home to the annual Land Diving celebration that is open to tourists. 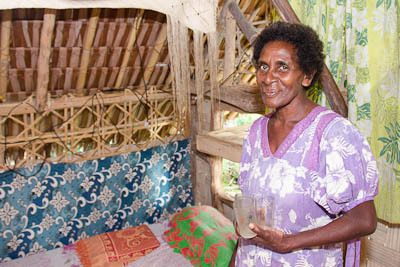 It is organized by Luke Fargo (Londot, South Pentecost, Vanuatu) who also has a number of available guest houses. See Land Diving Tours for more information. The towers are built for the the April-June ceremony and are then removed. Visiting other times of the year you will find few, if any, tourists. We visited in September and were the only yacht or tourists in the area. Luke took time to show us around and teach us about Land Diving. He also told us a number of their traditional stories. Loltong, in the north east is one of the nicest anchorages in Vanuatu. Protected by a circling reef, protected from SE winds with a sand bottom it is a safe place to spend time. On shore is the Vatulo Cruising Yacht Club, one of the most friendly places you could visit. Mathew and Eva welcome you to the bay, help with any issues you have and will fix a large traditional meal for you. It is worth the visit! 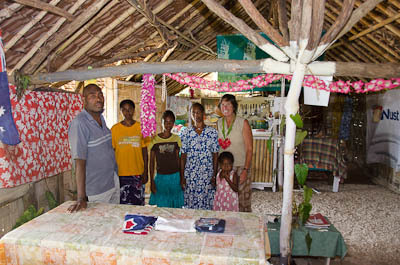 Just a short walk into the village is the Dumi Resturant.